OnsetTime Timestamp (in milliseconds from the start of the experiment) when the stimulus presentation actually began. OnsetDelay Difference in milliseconds between the actual onset time and the expected or "target" onset time. The "target" onset time is calculated internally by E-Prime as it prepares the object to be presented/processed. DurationError Difference in milliseconds between the actual duration and intended duration before the command ended. If the event is terminated by a response, a value of - 99999 will appear in the column (i.e., since the duration error cannot be computed in that sutation). Using (same as duration) for PreRelease makes this value obsolete. OnsetDelay: The OnsetDelay for a given object is the difference between the TargetOnsetTime for an object and its actual OnsetTime. In other words, OnsetDelay means the time elapsed between the intended onset time, as set by E-Prime 3.0 while the experiment is executing, and the actual onset time. If PreRelease is set to 0, then the intended onset time is essentially the OffsetTime of the previous object. OnsetDelay values greater than zero occur when the object needs time to load (e.g. images, video) or when it is waiting for the next refresh of the monitor. Ideally, you should see OnsetDelays of 0 or a negative value. (Negative values occur due to refresh alignment). Again, this only applies when PreRelease is not being used. OnsetToOnset: The OnsetToOnset value is the best metric to examine how long an object was visible. However, exercise caution when using the OnsetToOnset value as this value does not account for position of objects on the screen (i.e. objects displayed in the center of the screen do not appear until approximately ½ of a refresh rate later). This value does also not account for the use of an LCD monitor, which can add display latency. Finally, if the second object in the display does not paint over the first object, then the first object is still on the screen and visible. 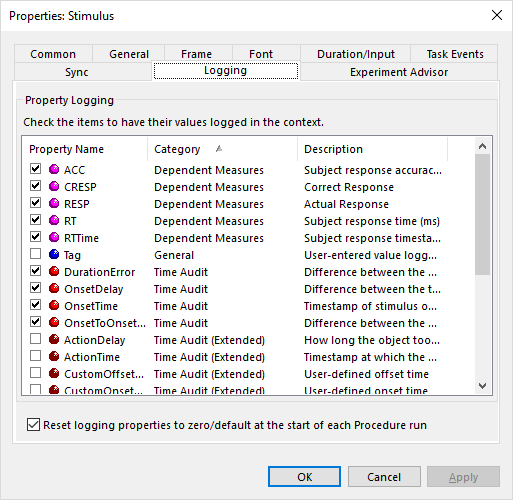 The TimeAudit Extended category contains a large number of variables. These will only be logged by manually selecting them; there is no option to enable them all in the Duration/Input tab. FinishTime and OffsetTime: There should be a 0 or 1 ms difference between these two values. Further, when PreRelease is set to “(same as duration)”, these values will be near the same as the OnsetTime. ActionDelay: The ActionDelay should be 0 or 1 ms. Any other values may indicate a hardware problem, particularly with the sound card or devices used with Task Events. See also discussion at https://groups.google.com/d/topic/e-prime/OeiZ00V9SRc/.